We are grateful to Tania Todorova, the founder of the International Copyright Literacy Survey, for providing a short report on the Copyright and Libraries Roundtable Discussion which was held on 26 February 2018 in House of Europe in Sofia, Bulgaria. Sadly we were not able to join her for the event but we sent a video message and were delighted to learn that the event was successful and led to the presentation of the Sofia Declaration: Europe needs its Libraries: Heritage and knowledge for a stronger EU. The following day Tania successfully defended her doctoral thesis, and was awarded a PhD for her research into copyright literacy. Monday’s event was a part of the programme on the 1st EBLIDA Executive Committee of the year held in Sofia, Bulgaria. Bulgaria currently runs the EU Presidency of the European Council. 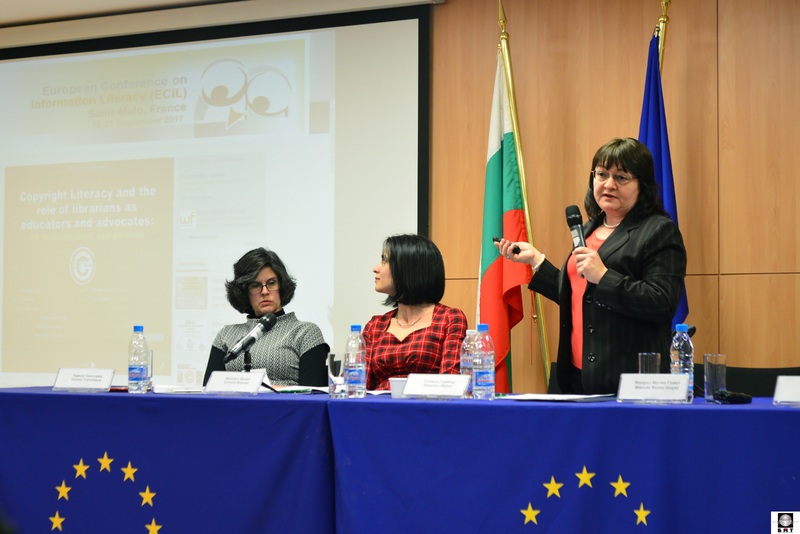 The Roundtable was organised with the support of Bulgarian Library and Information Association (BLIA), the University of Library Studies and Information Technologies and Global Libraries – Bulgaria Foundation. The view from the office of Commissioner Maria Gabriel, given in a presentation by Mr. Manuel Mateo Goyеt and the view of an MEP Mr. Emil Radev on the Digital Single Market (DSM) Directive. Marina Encheva (ULSIT). Information literacy of humanities students in Europe: a game-based learning approach for avoiding fake content (NAVIGATE project). More information from the day is available on the BLIA website. We were delighted to be part of the day and you can view the video message we made for the event. We were pleased to be able to participate in this event remotely and support the work of the international copyright literacy community. And congratulations to Dr Tania Todorova!